​Transfers. You love them. We love them. Clubs love them - some of them with careless abandon, some with unrequited distance. Basically, everyone loves transfers. Which is good, because here's a collection of the latest ones that could happen. ​Bayer Leverkusen and VfL Wolfsburg have identified Swansea City defender Ben Cabango as a candidate to replicate Jadon Sancho's success in the Bundesliga, despite the 18-year-old being yet to register a single first team appearance for the Swans. According to the ​Sun, the German duo have been scouting Cabango for the last few weeks in his turnouts for the Under-23s and have been impressed with the centre back's maturity. Of course, that 'next Jadon Sancho' label is perhaps misplaced, given that he is neither English nor a winger, but the 'next Rabbi Matondo' - who is Welsh but also a winger - doesn't quite have the same ring. As it stands, the 'next Reece Oxford' (?) is contracted with the Championship side until 2021, but could be available for as little as £2.5m. ​Premier League pair West Ham United and Leicester City have apparently become enamoured with Colchester United's young up-and-comer Noah Chilvers. The alarmingly fresh-faced Chilvers - who is not pictured here, that's just a rainy car park outside the JobServe Community Stadium, in case you were confused - made his debut for the first team last month, having impressed for both the Under-18s and Under-23s as an 18-year-old. The central midfielder, who can also occupy a playmaker role, is yet to sign a professional contract with the U's and could thus be plucked by either the Hammers or the Foxes for just a compensatory fee this summer, according to the ​Sun. ​Manchester United are tracking Sevilla centre forward Wissam Ben Yedder as a potential frontline replacement for Alexis Sanchez this summer, according to reports from Spain, as relayed by the ​Sun. The Frenchman, who dumped the Red Devils out of the Champions League last season with a supremely well-taken brace inside four minutes at Old Trafford, has notched 28 goals and eight assists this season. That goal tally not only represents the greatest seasonal haul of his career, but also his age, and with his contract set to expire in 2021, he looks set to become a hot commodity this summer. Continuing the British youth invasion of Germany theme, I offer you ​Chelsea academy graduates Mason Mount and Tammy Abraham. According to the ​Daily Mail, RB Leipzig have been monitoring the exploits of both Blues loanees in the Championship and have been sufficiently impressed with what they've seen. Of course, the caveat that looms over all Chelsea transfer news right now is the impending fate of their two-window transfer ban. Should that be upheld, it would be hard to see the club letting go of both these stars, on loan or not. Then again, it was hard to see them letting go of Nathaniel Chalobah and Ruben Loftus-Cheek in the stead of Danny Drinkwater in 2017, but that actually really happened, making the potential for both of these players leaving for no return fairly foreseeable... and a bit more agreeable. Almost ten years after signing Zlatan Ibrahimovic for €69m, ​Barcelona have turned their gaze to the man ascribed with the 'next Zlatan' moniker. 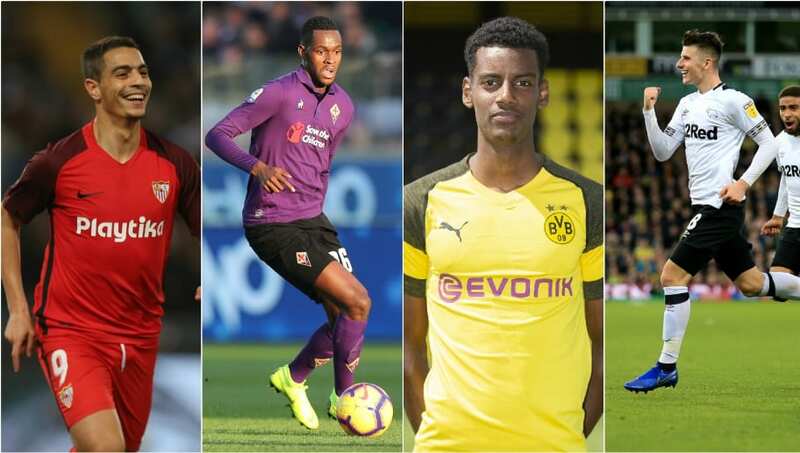 Alexander Isak has been wowing scouts since his early years at Swedish side IAK, but opted against a high-profile switch to Real Madrid, Barça, Bayern or Juventus in 2017 for the slightly less pressured annals of Borussia Dortmund. However, with ten goals from nine games on loan at Eredivisie side Willem II, the 19-year-old is now considering a move to said big leagues, with La Blaugrana closely monitoring the situation and the German side willing to consider offers, according to ​Mundo Deportivo. ​Everton and ​Arsenal target Wesley Moraes, who has previously been subject to a botched bid from Cardiff City and interest from Newcastle, has conceded his desire to move to the Premier League. Speaking to Belgian publication Het Belang van Limburg about the many teams coveting him, which also includes Fiorentina, CSKA Moscow and several CSL sides, the Club Brugge striker conceded: “I have read all those names. It is of course completely different going to China than to another European country. I don’t know what I want, I don’t want to exclude anything. Lyon are looking into the summer signing of ​West Ham United loanee Edimilson Fernandes, who is currently at Fiorentina, as a potential replacement for Tanguy Ndombele. Fernandes, who joined the Hammers for €6.4m back in 2016 from FC Sion, struggled to stake a place in east London but has impressed in Italy. However, with Fiorentina at a crossroads with coach Stefano Pioli, it is unsure whether they will take up their offer to buy the Swiss international outright this summer. And, according to Le10 Sport, this could allow the Ligue 1 side to swoop in and sign the 22-year-old, whose future seems destined to lie away from the English capital, akin to the highly rated Ndombele and his French dwellings.